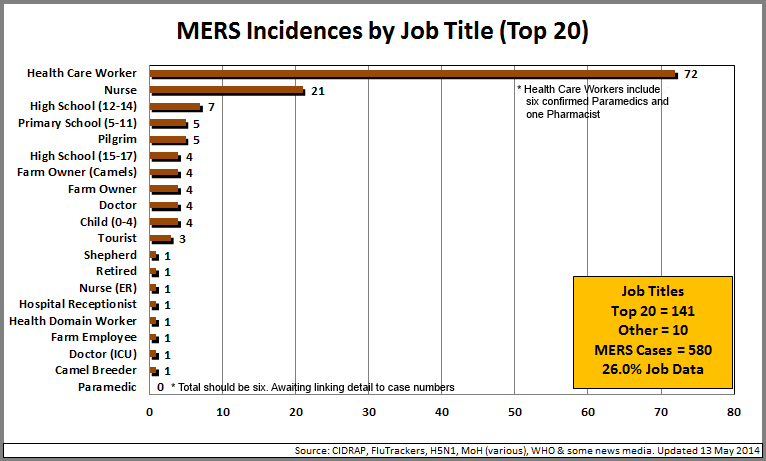 According to Flutrackers there have been 580-cases of MERS-CoV that have been clinically diagnosed. The fatality count is a little harder to gauge given the poor data that comes out of the Middle East but Dr Ian Mackay via his blog Virology Down Under believes the number to be 161 out of 571-cases (a Case Fatality Rate of 28.2%). His total does not include the three deaths that were announced by the Saudi Ministry of Health (MoH) overnight. In the past 24-hours the Centers for Disease Control and Prevention (CDC) have announced the second imported case of the Middle Eastern Respiratory Syndrome (MERS-CoV). All the details have not yet been confirmed but the second case, like the first was in a returning Health Care Worker. Since the 28th April the Saudi MoH has cut all details about cases involving Health Care Workers and resident/citizen status. Even so, I have been able to detail 151-job titles including the most recent Health Care Worker who travelled from Saudi Arabia to the United States and was hospitalised in Florida. Looking at the Job Titles the stand out point is that 47.7% of the data is associated with the occupation of ‘Health Care Worker’. This could be anyone occupied as an anaesthetist, dentist, doctor, lab-tech, midwife, nurse, optometrist, pharmacist, surgeon or even veterinarian. One of my chief complaints about occupation data being given (outside of outright suppression) is that the term ‘Health Care Worker’ lacks detail and is little more than a ‘throw-away line’. That aside the leading occupations are Health Care Worker (47.7%), Nurse (13.9%), High School (12-14) at (4.6%), Primary School (5-11) and Pilgrims (both at 3.3%). There are currently 9 different Health Care Workers job titles that have confirmed… They include Nurse (21); Paramedic (6 – currently counted as a HCW), Doctor (4), Nurse (ER – 1), Health Domain Worker (1), Doctor (ICU), Pharmacist (1 – currently counted as a HCW), Respiratory Therapist (1) and a Surgeon (1). Nine Farm Owners have been confirmed but only two Farm Employees which might suggest that Farm Owners (citizens) are being tested but their Farm Employees (often poor residents) have not been tested or their details are being suppressed. Farming, Forestry and Fishing (7.3%) comprising Camel Breeder, Farm Employee, Farm Owner and a Shepherd. Paediatric cases only make up 2.8% of the data. I don’t see a lot of virology commentary on this but it seems low given that MERS seems to be able to spread within family and hospital clusters. 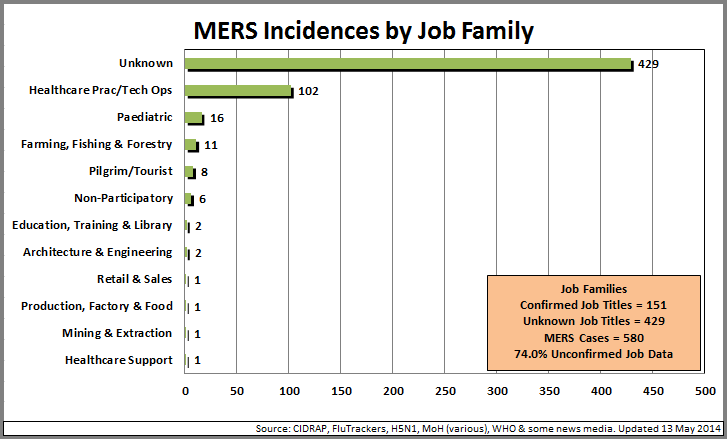 The MERS data has thrown up the first Healthcare Support worker, a Hospital Receptionist who was diagnosed in Jeddah, KSA. I also suspect the Health Domain Worker to be in this category but without specific detail I left it in the Healthcare Prac/Tech Ops Family. With just one in four cases being confirmed for occupation I’m not sure that any reporting on the subject adds much to the level of public knowledge about the causes and progress of MERS outside of the fact that the spike in HCW in April points to a lack of infection control in Saudi hospitals. Suppression is a strong term but as noted in the opening paragraph the Saudi’s have not provided any detail into occupation or resident/citizen states since the 28th April. The Saudi’s have their reasons for this (and they cannot be good). Sometimes a lack of data can be just as enlightening as lots of it.